A process which lightens discoloured enamel and dentine. There are 2 types of treatments available in our practice. Extensive research and clinical studies, indicate that whitening teeth under the supervision of a dentist (either in the surgery or at home) is safe. Both have equally good results. 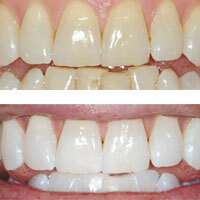 Zoom WhiteSpeed chairside whitening system is ideal for anyone requesting immediate results. It is the perfect choice for the busy individual, the bridal party etc. Bleaching Gel is applied to the teeth and the Zoom light positioned to activate the gel. 2. Take home tray bleaching kits: this involves taking impressions of your teeth and having custom trays constructed. We teach you how to apply the bleaching gel onto your teeth using the custom made trays. The trays must be worn preferably overnight for a period of 2-3weeks. Even after one week noticeable improvement may be seen. A follow up appointment is needed to review progress and thepatient continues until the desired shade is achieved. 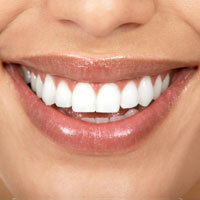 Prior to any teeth bleaching a consultation must be carried out by our dentists. Teeth discoloured by age, genetics, smoking, tea, coffee stains and simply “yellow teeth” respond best to teeth bleaching. Bleaching is generally not indicated on children (primary teeth) except in trauma situations. Bleaching treatment is not recommended on pregnant women or nursing mothers because in general it is good practice to post pone all elective dental procedures during pregnancy.